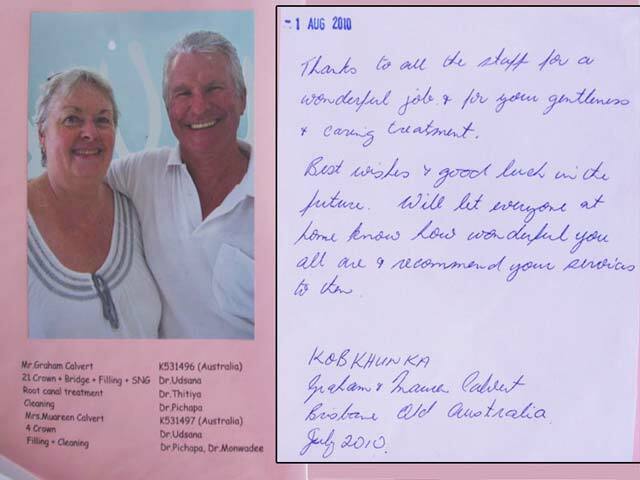 Maureen and Graham Calvert from Brisbane, Australia chose to have their smiles refurbished at the leading ISO 9001:2008 certified dental clinic we work with in the Patong area of Phuket, Thailand. “Thanks to all the staff for a wonderful job and for your gentleness and caring treatment. Best wishes and good luck in the future. Will let everyone at home know how wonderful you all are and recommend your services to them. While Graham’s dental makeover involved 21 dental crowns, bridges, fillings, SNG root canal treatment, and cleaning, Maureen had four dental crowns, cleaning, and filling. Submit the free quote-request form on the right for more information on dental treatment in Patong, Thailand.